J. Jane Consulting | amy lacey. richmond, virginia. | news anchor. advocate. wife. friend. Richmond offers easy living, vibrant communities, and friendly neighbors who remain true to their commitment to southern hospitality. Over the years I have called many different places home, and while each location presented a unique experience, the Richmond area has a magical element to it and a neighbor-helping-neighbor mentality that makes me feel right at home. This commitment to community is… Positively Richmond. Upon settling, my husband and I immediately identified our favorite spots to enjoy a quick lunch or romantic dinner. We researched doctors, auto repair shops, and the best place to buy fresh flowers. Of course, we needed to keep up with the local news, and began to watch ABC 8 News. This find delighted me for a plethora of reasons: I love their Positively Richmond segment, and I am fascinated by the news anchor career path. Additionally, I am working hard to grow our media and communications category on j. jane. While watching this talented woman share local happenings, I noted something special about her approach. At first, I could not precisely put my finger on it, but I suspected that she was empathetic and optimistic—unique qualities to possess when you are reporting on the daily news, most of which is difficult for the human spirit to absorb on a regular basis. I connected with Ms. Lacey on social media and quickly found out that she was approachable— another distinctive trait. I requested an interview and we met for tea to learn more about one another. All my suspicions were confirmed— this is a woman who connects with her surroundings and it shines through on television and in person. Allow me to introduce you to Amy Lacey, an anchor woman that has a genuine interest in those she comes across. She knows how to share reality with a side of compassion, while shining a light on the abundance of goodness that surrounds us all. Was there a fork in the road that distinctly determined your career? AND/OR How did you choose your career path? I am one of those lucky few who knew exactly what I wanted to do from a young age. Very early on, I dabbled with becoming a professional figure skater (thanks to Dorothy Hamill’s great hair and beautiful costumes), followed by a Veterinarian for a few years because I love animals so much (witnessing a Vet check my Boston Terrier for worms promptly ended that dream for me). It was in fifth grade that a conversation in my classroom changed my life. We were talking about some current events, and the name Sally Wiggin came up a few times. Sally is a legendary news anchor in Pittsburgh where I grew up (she is still on the air there!). I realized that we all knew what was happening in the world because of Sally. What a huge responsibility she had! I wanted that kind of responsibility one day. There was just one slight problem; I was painfully shy. We’re talking nail biting, wallflower, hesitant to ever speak up shy. So, how does a beyond introvert make it in the very boisterous news business? I knew I would have to work harder than everyone else, so I started pursuing it as early as I could. I had several unpaid internships in television, radio and public relations throughout college. My sophomore year at Duquesne University, I was lucky enough to get a part-time, on-air job at WDUQ-FM, an NPR station that, at the time, was based on my campus. It required me to go to press conferences in Pittsburgh, City Council meetings, Election Nights, you name it and cover stories along with the likes of Sally Wiggin. I made it my personal goal to ask a question at each one to break out of my shell. I’d then rush back to the radio station, write up a short newscast and broadcast it on the radio. Oh, and then I’d go to a Psych class or sorority meeting. I was living the best of both worlds! I kept that job until the week I graduated from college. During my senior year, I added a news writer/associate producer position at WPXI-TV to the mix. I was there for a few months after graduation. From there, I accepted my first on-air general assignment reporter position at KOAM-TV in Joplin, MO/Pittsburg, KS. Fifteen months later, I manned the beach bureau at WCTI-TV in New Bern, NC. After about two and a half years of sand in my shoes and learning more about sea turtles than the average human, I moved to Richmond, VA. April 2015 is eleven years at WRIC-TV. It has gone by in a flash! When you are a news reporter out in the “field” as we call our respective communities, you see the good, the bad and the ugly of everything! The first time I responded to the scene of a major interstate crash was very sobering and a huge eye opener for me – just how precious life is, and you realize you’re not the one in charge. When I first started out as an on-air reporter, I was also my own photographer and editor, and I was dispatched to a tractor trailer versus Honda accident on Interstate 44 somewhere near Joplin, Missouri. My 23-year-old self was not prepared for what I saw, standing there alone on the side of the highway. The deceased individuals had already been taken away, but their cooler filled with drinks was strewn across the pavement. A bag of Doritos was crushed and scattered. A Yankees baseball cap was off to the side of the road. It hit me – I mean, practically sucker punched me — as I looked around the scene that these people were likely on a road trip that day, having a leisurely drive when the accident happened. There is no way they knew when they woke up that morning and started the drive that it would be their last. As difficult as that heavy topic is to digest, it’s something that I often think of as an excruciatingly difficult moment that I turned into a positive. Working in an industry where I am surrounded with so much loss, I realized early on that you have to live each day to the fullest. You really, really do. Yes, I do sweat the small stuff sometimes (don’t we all? ), but I recognize that each moment and each opportunity we have to just live should not be taken for granted. Television news is literally an around-the-clock business, so finding a professional/personal life balance is always a challenge! My husband also has a very demanding career, so there is a lot of give and take, more than most couples I know. My family and friends are also scattered around the country, so I do my best to give everyone as much time as I can possibly find. With all the juggling, I sometimes manage to have what seems like a 25-hour day or an eight-day week! For about a third of my career, I regularly worked an overnight shift that either required me to start my work day at midnight (as a field reporter) or 2:45 a.m. (when I anchored the morning show). I’d sleep in the afternoon and evening and still somehow managed to find the time and energy to bake a cake for a co-worker’s baby shower, travel home to Pennsylvania for one of my niece’s birthday parties or go on a movie date with my husband (though I lost count long ago of all the movies that I’ve seen the beginnings of but have no idea how they end because I fell asleep!) Life is a daily to do list, and crossing off each priority is an accomplishment in itself…and it certainly makes the occasional lazy Saturday even better! As an anchorwoman, what do you feel is your greatest responsibility? I truly do want to make a difference in the community and give a voice to those who need one. I am privileged that I can use the airwaves to raise awareness about everything from crime alerts happening in someone’s neighborhood to health screenings people need to schedule to animal welfare issues, which are so close to my heart. It’s very rewarding to be grocery shopping on a Saturday and have a woman come up to you and say thank you for doing a story about a new cancer treatment and then explain her daughter who’s been struggling is now going to look into it. Wow. Moments like that are priceless. I want this community to know how invested I am in it. I truly care about the people living here and want to help make our region the best it can be. I am passionate about helping nonprofits and lend my services as often as I can when they need an emcee for one of their events or a speaker. You will also often find me talking about what I do with classes from pre-school to college. It’s very rewarding when I see that spark in a student’s eye when they get as excited about tv news as I still do. A sense of altruism always pushes me to give my all every day. How can we encourage young girls to think about their career paths early on? I always say that you have to find your passion and then run with it! You can make a career out of any of your interests, and if you truly love what you do it will never be work. When I speak at high school career days, I always tell the students that they shouldn’t wait to explore their options once they actually get to college. Then when they declare a major, they shouldn’t wait until they have a degree to apply for job opportunities. No matter what you do, there is a lot of competition. You always have to look for ways to give yourself an edge and build your resume. No class can truly prepare you for what happens in the workplace. Internships are invaluable. It was only once I got a look inside a newsroom and saw how each person contributed to the final product did I really know I really wanted to work in broadcasting. Volunteering is also a way that I recommend students pursue potential careers. Interested in journalism? Find a nonprofit that needs someone to write articles for its newsletter. Think you want to be a doctor? Get involved in a local organization that helps pediatric cancer patients. There is a lot of trial and error, liking some careers and maybe not being suited for others. Just get out there! Sometimes you don’t find your path. Your path finds you. I live my life in front of a camera, and sometimes that in itself is a nightmare (nothing quite prepares you to see your face on someone’s 60-inch flat screen!) Live TV is very humbling, and I think making mistakes helps you grow. I know it has for me! Be kind. Forgive. Love. Be a champion for yourself and everyone around you. 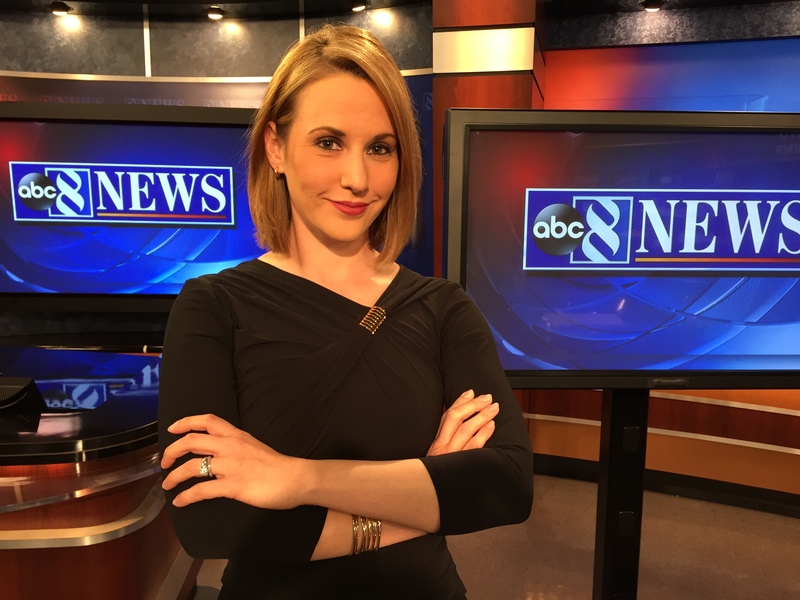 You may watch Amy Lacey deliver the Richmond area news on ABC 8 News and visit her news team at WRIC.com or on the ABC 8 News Facebook page. Also, be sure to connect with Amy on Facebook and Twitter. Excellent interview and great insight! You are fabulous. You have a knack for bringing out the brighter side in your viewers… because you do have those distinctive features (in a news anchor) of genuine care, trust, and kindness. You leave a lovely legacy everywhere. Amy is a true professional and has an incredible passion to help make the Richmond region stronger. She also tirelessly gives of her time to help many nonprofits. Richmond is lucky to have Amy as part of our community! Love the article…and we, the WRIC viewers…love Mrs. Lacey as well and the fun and professionalism she brings to our daily news!! She is especially close to my heart due to her adoration of animals and their well being. THAT one attribute alone…really hits home with me! I have a great admiration and respect for Amy…knowing how much she sincerely cares!